I was just reading the new Marieke van de Loosdrecht et al. 2018 paper [LINK] about the Pleistocene North African hunter-gatherers, and really enjoying it, until I saw this strange map. Please note that I edited the image for the purpose of review and to highlight an error (red pointer and arrow). This is either a stupid oversight, or the authors of the paper, mainly from the Max Planck Institute for the Science of Human History, and also the scientists who peer reviewed it, don't know where the steppe is located in Eastern Europe. It's certainly not located anywhere near Karelia, Northern Russia, as the map suggests. Now, you might say that I'm being nit picky. Well I'm not, because I can see an alarming trend emerging. Here's a quote from Aida Andrades Valtueña et al. 2017 [LINK], another paper authored mainly by scientists from the Max Planck Institute for the Science of Human History. The Baltic Late Neolithic Y. pestis genomes (Gyvakarai1 and KunilaII) were reconstructed from individuals associated with the Corded Ware complex. Along with the Croatian Y. pestis genome (Vucedol complex) these are derived from a common ancestor shared with the Yamnaya-derived RK1001 and Afanasievo-derived RISE509. This supports the notion of the pathogen spreading in the context of the large-scale expansion of steppe peoples from Central Eurasia to Eastern and Central Europe. Thus, what the authors are claiming is that the Pontic-Caspian steppe, which is where the Yamnaya culture was located, is in Central Eurasia rather than West Eurasia. Obviously, Eurasia is a landmass made of up two continents: Europe and Asia. Try putting your finger in the middle of a map of Europe and Asia and see whether it lands anywhere near the Pontic-Caspian steppe. It won't, unless you've got the shakes or something, because Central Eurasia is more or less located around the Altai Mountains, between the Kazakh and Mongolian-Manchurian steppes, several thousand miles east of the Pontic-Caspian steppe. Just another oversight, you might say? I doubt it, because here's a very similar case from Alissa Mittnik et al. 2018 [LINK], yet another paper authored mainly by scientists from the Max Planck Institute for the Science of Human History. Studies of ancient genomes have shown that those associated with the CWC were closely related to the pastoralists of the Yamnaya Culture from the Pontic-Caspian steppe, introducing a genetic component that was not present in Europe previously [2, 3]. Nope, sorry, that doesn't make any sense whatsoever. Why? Because the Pontic-Caspian steppe is west of the Ural Mountains, therefore it's in Europe. You see, according to current geographic conventions, Eurasia west of the Urals and north of the Caucasus is Europe. Right or wrong, as things stand, that's just how it is. And if you happen to be a Max Planck scientist and adamant that I'm wrong, then Google it. I dare you to. - the Yamnaya culture or horizon was entirely located within the Pontic-Caspian steppe, and therefore in Europe, and more precisely, in Eastern Europe. Actually I think you are nitpicking with the first one. The label is not "steppe", but "+steppe" and it is the only one with a "+" sign. It is an awkward method, but they probably tried to say the sample _also_ represents HG-s from the actual European steppe (genetically). As for other things: I encountered a certain West-European mindset many times. For them, Europe is the EU and what is attached to it or surrounded by it. I even had a funny misunderstanding with a Scottish guy years ago, because we disagreed on whether Moscow is in Europe or not. The idea that Moscow is in Europe did not even occur to him before we talked. Their map is wrong. My map shows why it's wrong. Can't add anything to that. @Slumbery, EHG means Eastern (European) Hanter-Gather, the Pontic-Caspian Steppe is part of Eastern Europe. Instead strange steppe I had to write proper Eastern Europe. Science is not guided by the views of uneducated people, therefore, instead incorrect simple Europe at WHG they should have written Western Europe. seems like it doesn't fit the politically correct agenda to say the steppe people are European, they have to say "central-asian" just like the Cheddar man was defined as a "black male" even though he was genetically nothing to do with Africans. In conclusion, Seems like we Europeans don't have the right to be indigenous of our own land. But yes, their labeling is bad. What I wrote was not really meant to be an argument against your take. More like a background. I said you are nitpicking on the first one, because they clearly did not mean to say that Karelia is on the Steppe. Of course the labeling of the map is bad regardless. 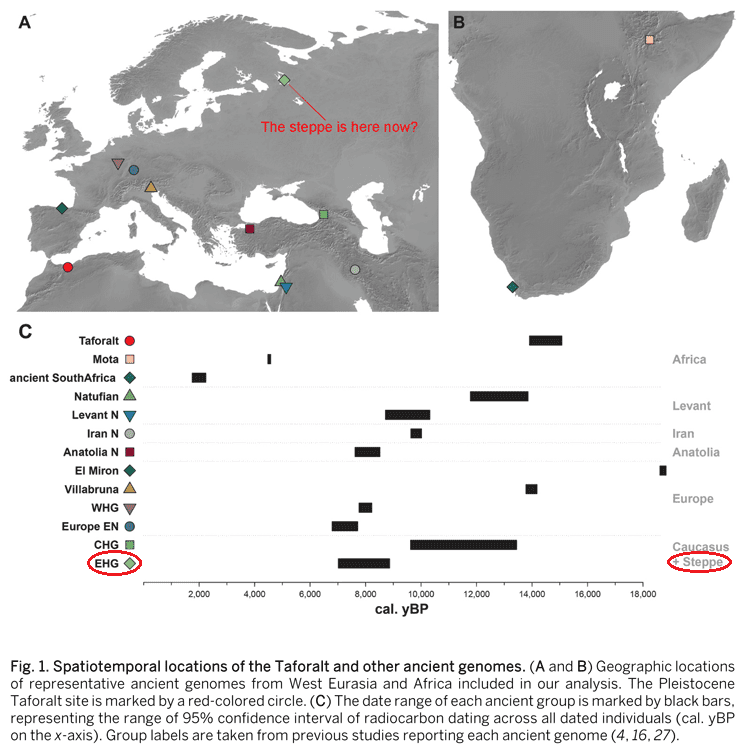 But what about the amazing fact that we have Palaeolithic genomes from southwest Eurasia ? Southwest Eurasia would be pretty much Arabia and surroundings. :) I think Europe is general (even most of the Mediterranean region) is too northern for that. So SW Eurasia is the same as SW Asia. That's a minor issue, a bit off-topic compared to this major paper. But "Eurasia", to my knowledge, is not a way to group two distinct "continents" under a single short word but a way to correct the arbitrary and fluctuating borders between "Europe" and "Asia": geologically, there is no such thing as Europe or Asia, but there is Eurasia and even India is more of a continent than Europe. Anyway, not surprising to find African/"SSA" ancestry in North Africa the further back in time we go. But Eurasian influence is confirmed to be very old in Africa, clearly even older than these Iberomaurusian samples. As for the "Iberian-ness" of Pleistocene North Africa, it looks less and less probable so we might as well call Iberomaurusians the shorter "Oranians" alternative once and for all. btw, do you guys remember last year I said mtDNA U5a1b1 in Iberian Bell Beaker means some had Steppe admixture? "......Among the scientists, the proportion of those from abroad was 47% – this high proportion can be attributed to the fact the International Max Planck Research Schools particularly recruit international Ph.D. students and that a high number of visiting scientists come from abroad. As of December 31, 2016, 27% of all of the employees were foreign nationals. The financing of the Max Planck Society is predominantly comprised of basic financing from the public sector, in the year 2017 the MPG is financed to approximately 1,8 billion euros. In addition, the Max Planck Society and its Institutes receive third party project funding from public and private contributions and from the European Union. The federal and state governments jointly provide the subsidies for the budget of the Max Planck Society." @Davidski Has I6561 been confirmed as L667 or Z93 David? With respect, words mean whatever people use them to mean - neither more nor less. The meaning of a word is its use in the language. I can't speak for other parts of the English-speaking world, but at least in the UK I think there has long been an established sense of "Europe" as excluding the USSR by definition (actually, this goes back to at least the 19th century, where many people talked of the political/cultural division between 'Europe' and 'Russia'; 'Europe' in this sense is essentially "the part of the West located in Eurasia". See for example Slumberry's anecdote in the first comment here. Similarly, I have in the past 'corrected' people who say that the Shard is the tallest building in Europe - it literally never occurs to most people here (including newspapers, periodicals, journals, non-fiction books, novels) that Moscow could be considered part of Europe. Similarly, Istanbul isn't normally considered a European city (although Tblisi sometimes is). Now of course you're right that "Europe" is also a particular term in the specific jargon of Europe, where it is defined as being much larger. But it's common for even scientific writers in one field to use the normal meaning of terms outside their specific field, rather than the jargon that would be appropriate to other fields that they tangentially touch upon. Hence, in normal usage, the correct answer to both "is a chaffinch a type of dinosaur?" and "was Julius Caesar a bony fish?" is "no" - even though the cladistic biologists might insist that, using the 'correct technical definitions', the answer to both should be 'yes'. Likewise, if you say that a peanut is a fruit, and a banana is a berry (but a strawberry isn't), you'll get some very odd looks. Similarly, at least in the UK, the normally correct answer to 'is Moscow in Europe?' is just 'no' - unless you're writing a geography paper. One would think that people putting out a paper would bother to google a place if they don't know where it is. The influence of North Eastern Europeans or so called Hyperboreans on the development of Greek and Indian civilizations is the most likely explanation of many similarities in religion, poetry and philosophy of Greece and India. Has I6561 been confirmed as L667 or Z93 David? I can't add to what I've already posted about this sample. Apparently, it's Z93+ and on a lineage leading to L657. Try getting in touch with Yfull and ask them. @Davidski Oh, thanks.Hope we'll know soon enough. "Obviously, Eurasia is a landmass made of up two continents: Europe and Asia." This is a social convention and not at all obvious. If you are going to break Eurasian into just two continents the obvious way to do so would be at the Himalayas (N v. South) and not the Urals. Methinks you should give the researchers a bit of slack Davidski. In the Atlantic interview with Reich, he mentions that many archaeologists left various projects because of the political implications of the findings, and archaeologists are a famously gnarly, monopolistic and quarrelsome bunch, with near-shouting matches at conferences by no means a rare occurrence. Now, I'm not agreeing or disagreeing with this. In my opinion, the political implications of archaeology are probably much overestimated. But this is a reality that those of us interested in the field have to deal with; the archaeologists are the gatekeepers to the samples after all. So the researchers on the genetic side probably have to pay attention to the optics of the situation. A little change in geographic naming may be a price they have to pay. Its all semantics anyway. Let's just claim and focus on the empirical territory and leave the semantics and politics to those who are more interested in that. There are very many archaeologists who are excited for the "new empiricism" too, let's not make things too hard for them by getting the public forums where this information is best disseminated (your blog is one of them) bogged down by these types of debates. These scientists at Max Planck are just being sloppy. They need to learn some geography. I don't think it's more complicated than that. By most measures, Europe is delineated as north of the Caucasus and west of the Urals. The Pontic Steppe is clearly within the boarders. What they're doing is like saying that Kamchatka is part of North America because it sits on the North American plate. Bad Geography should be called out. I deleted cpk's comment because he was obviously trolling, or he's not too clever. Same thing, really. Its hilarious to see how the afrocentric posters on other sites like forumbiodiversity and anthrogenica are in such extreme denial when it comes to haplogroup E and the fact that natufians dont have any SSA admixture. There really is no possibility left for them to argue that E-m35 originated in a SSA population, it must have originated in a Natufian/BE-related population, who genetially are a eurasian population regardless if this component originated in the middle east or north africa. So now the afrocentrists who know that the genetic argument is lost instead try to argue about geography, because in their conditioned mind, anything in Africa is related or connected to them in some way and they know most people make the association to black people when african is mentioned, even though majority group in north africa arent black and dont identify with them. Its quite funny because it really doesnt matter in the end, genetically and phenotypically the first E carriers and especially the first E-m35 carriers, did not look anything like modern blacks/SSA people. The original basal eurasians would be far closer to south west asians in appearance and such is true about E-m35 as well and likely older E clades as well, except the oldest E clade carriers who likely didnt resemble any modern population since they are about 50.000 years old. Mota does have some eurasian mixture but doesnt seem to have natufian specific admixture, which means the E1a and E1b might have separated before basal eurasian and SSA ancestors split off from each other. And now today we find plenty of E1b clades in SSA populations due to these Basal eurasians moving south and mixing with black women and replacing many of the local black men who carried mainly A and B lineages. yay, more North African aDNA! the IAM Moroccan Early Neolithic samples are also M1b, U6, and E-M35, whatever admixture has happened in the meantime should be detectable by comparing IAM and Taforalt. probably the SSA in IAM is very old. on the PCAs in the IAM paper one of the IAMs was an outlier, the others closer to Neolithic Europeans, so i'm guessing they had varying amounts of Neolithic admixture already. but we can see if it is all Cardial or there is anything more Levantine maybe. YF's TMRCA of E-M35 and the new aDNA-calibrated TMRCAs for M1 and U6a all centre on 24 000 years ago. 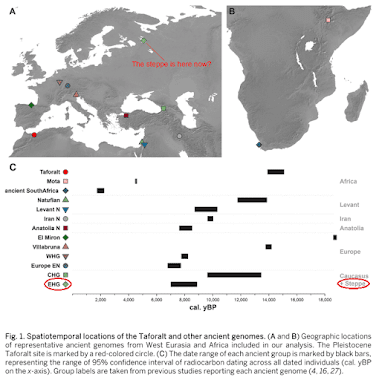 there is no f3 or ALDER signal of SSA-WE admixture in Taforalt, so the SSA-WE mixing must have happened prior to their formative drift, could be at that time. anyone have a handle on relevant archaeology? Nile valley foragers and early Epipalaeolithic people from the Near East, something like that possible? lol the mean Afrocentric mods at Anthrogenica banned you again? you should post on EgyptSearch, they're more on your level. Perhaps c 35 kya, during a north African wet phase encouraging the postulated Eurasian back-migration, ? & arrival of Hg E (TMRCA 35kya too). @EastPole, Geoffrey Ashe in his "Dawn Before the Dawn" elaborated on the idea that the Hyperboreans were possibly a mongoloid shamanic seedbed culture in the Altaic region. It is an interesting read, if you're interested. We can't conclude just yet that Taforalt people had "actual" SSA. They had AFFINITY to modern day-SSAs(well, w/in last 4k years), sure, but that affinity could easily be due to an early back-migration of some para-Eurasian clade rich in U6 and possibly E1a. I.E: Yoruba, Mende, etc. have significant back-migrant ancestry that's an outgroup to all components of & not represented in modern-day Eurasians. Then, another back-migration into NA brought "proper" Eurasian ancestry mainly rich in E-m78 and increased affinity to Natufians. This probably continued into the early Neolithic times, judging by IAM's relative shift. I wrote a few comments in the relevant Anthrogenica thread about this. Its just false that the samples had no SSA. Look at figure S15. SSA "proper" is confirmed in Taforalt. Its also false that the Nile is the best place for this SSA to have arrived. The SSA clades with Yoruba the most, and we know that the Mota-Hadza like HGs are ancient in East Africa. People need to read the paper with more care man. "Its quite funny because it really doesnt matter in the end, genetically and phenotypically the first E carriers and especially the first E-m35 carriers, did not look anything like modern blacks/SSA people." Agree on phylogeny(well, partially, because I believe a lot, if not all, modern SSAs have different levels of back-migrant ancestry). BUT, they sure as heck weren't "Caucasoid"-looking, and I'm talking craniofacials, not pigmentation(which would obviously be quite dark). Think about it: if Onge, Agta, Papuans, etc. don't show phenotype specialization, early para and basal eurasians would have looked relatively ancestral in most aspects. The pigmentation and Caucasoid cranial leanings of modern-day Kabyle owe themselves mostly to Neolithic era processes when later streams of people from the East and Iberia carrying PPNB-related DNA augmented the gene pool, not to the earliest wave of back-migrants into the region. Where did I say there is no SSA admixture ? Read more carefully man ! My comment to you was about the Nile part. The extreme Yoruba-like nature of the SSA in Taforalt makes the Nile an unlikely place for admixture. The f3 ratio bi-plot, right? Again, how does it reject what I'm proposing? For all we know, Taforalt has ancestry from a back-migrant lineage/split that was an OUTGROUP to all other Eurasian clades *AND* basal_Eurasian-related ancestry from a later split that's ubiquitous in the ME(and Europe for that matter). SSAs only have the former while Natufians and all other contemporary MEs only had latter.Voila. The problem is, if that's the case that outgroup ancestry will account for most of the ancestry of the Yoruba (and thus by necessity be quite diverged, more than Mota) and then also minority fractions of the ancestry of Mbuti-Biaka, Mota and Hadza, and south African HGs. At the same time it will not be represented outside Africa. At that point it's just identical to an African component. This sample shares a lot of drift with Yoruba, any shared ancestry between Taforalt and Yoruba will have to be very large in Yoruba (and thus quite diverged). If you look at fig S16, it's clear that once you account for Natufian ancestry in Taforalt, the remainder shares more drift with Mende, Mandenka and other West Africans than with even Mora. This quite clearly demonstrates that this ancestry clades outside of Eurasian or peri-Eurasian clades and preferentially goes with SSA populations more diverged than Mota, i.e. "proper" SSA. @David, speaking of "against geography" what about the "Natufian Puzzle" where the Natufians in TreeMix have 9% SSA ancestry, but now we see in the Taforalt Reich paper that the Natufians have 37% WHG which is entirely shared by the Taforalt Iberomaurusians? Could it be that the gene flow is going from the Iberomaurusians (or an earlier proto-Afro-Asiatic group) to the Natufians, as well as to the "Villabruna" WHGs, who were thought to have additional "Basal Eurasian" compared to the earlier Epigravettians? What if there's no WHG at all in the Natufians, but rather a kind of Iberomaurusian + SSA, and just some section of Iberomaurusian in the WHGs, post-LGM? How do the Natufians and WHGs come out with the new African samples aside from just having Mota as in the TreeMix above? "At that point it's just identical to an African component." Well, effectively, yeah, but a component sharing more drift with Eurasians than other African components. Can't comment on the relative magnitudes of things, though. Not sure when these splits occurred nor what other portion constitutes Yoruba's ancestry. As for S16---maybe they have a type of ancestry that affected West Africa to a greater degree than other Africans? Not impossible. I knew the farmers genomes from Morocco were not entirely of recent Near Eastern origin. It looks like they were of largely local hunter-gatherer decent. Also, I was confident U6 didn't have any relatively recent origin in Europe. All ancestry that does not clade with Natufian (and that includes peri-OoA ancestry of any kind) clades more strongly with Yoruba against Mota. In fact it even clades with Ju_Hoan more. This means this ancestry has to be "outside" any expanded clade of Eurasian and more related to a properly separated sub-saharan African population however we wanna define it. I.e. if all ancestry in Taforalt is split between that more closely related to Natufian and that most closely related to some strictly non-"expanded Eurasian" clade, the strictly non-Eurasian clade is most Yoruba-like and definitely forms a clade against anything that is Eurasian-Natufian. ^^ when I say "All ancestry" I mean ancestry in Taforalt. Why not the more parsimonious explanation that this "African" clustering ancestry is just ... African? Notice that there wasn't any habitable area between northwest Africa, the Ethiopian Highlands, and West Africa. The Nile wasn't flowing at all at that point. Northwest Africa would be the perfect place for at least some parts of E-M35 to survive, and in fact, the LGM is the tMRCA of the two major subclades of E-M35, E-Z827 and E-L539. It's also possible that E-M35 split at the start of the LGM, with E-Z827 and E-L539 or parts of them surviving in separate regions, perhaps the Ethiopian Highlands and Northwest Africa. They would have expanded again after the LGM. Eh, Skoglund and Reich 2017 clades Hadza and Mota tgt as the last branch to split before OoA, whose ancestry never reached the Natufians but is widespread in East Africans today and used to spread to Malawi and the Rift Valley region. Whether or not it's African is your call, but it certainly never reached Eurasia until pretty recently. Ancestry from this Northwest African LGM refugium would have expanded throughout Western Eurasia in the Neolithic via the Natufians. As I said, there may have been such ancestry directly from the Iberomaurusians to the WHGs through Iberia. Looking at this from a "modern" perspective, this kind of ancestry would be considered "Eurasian" but symmetrically related / "basal" to all other Eurasians, because it's so common in Eurasia. Also notice how distant and cut off this Northwest African LGM refugium was from its nearest neighbors in West Africa. The result would be that as it left Africa, it would look very distinct from any other Africans (i.e. Sub-Saharan Africans), and might just appear to some to be another kind of "Eurasian" - but one lacking in Neanderthal ancestry. Taforalt Iberomaurusian does appear to be "halfway" between WHG (37% of the "Natufian" 70% = 25.9%) and SSA, particularly West African (30%). So it could just be that this "Basal Eurasian" is just the 70% of the Iberomaurusian component not lost by drift as it went outward. There is also the issue of the "unplaceable" SSA ancestry among the Iberomaurusians, which as people have noted, appears to be something very ancient, because it's also symmetrical to other Africans, a kind of "Basal African". It really is just another part of the pre-LGM African population which had more opportunity for mixing, and it's a sign of the long continuous presence of the proto-Iberomaurusian (Proto-Afro-Asiatic?) population in Africa, which is evidence against them being the result any sort of Eurasian back-migration. "Unplaceable" "Basal Eurasian" combined with "unplaceable" "Basal African" = just another early African population. Perhaps this could be proven by testing the relative percentage of Neanderthal ancestry in Taforalt, compared to Epigravettian Europeans, CHGs, and Iranian hunter-gatherers. I think it might prove to be extremely low, or non-existent. More breaks off of what? Do you know how trees are built? The last branch is the last branch. Just because they didn't contribute to Eurasians populations doesn't make them Not the last branch off. I'm sayin basal Eurasian does not form a clade with Mota and Hadza. It branched off from Eurasians after the Mota-Hadza group did. Yep they were the last branch, no disagreements there. I was just saying that the pure Basal Eurasian in Natufian and Iran_H need not have ever been alive in Eurasia proper. Fine. I guess how people like to say it here is, Mota/Hadza were Pre-Basal-Eurasian. Can't this also explain things? Thank you Robert, but I am not interested. I know who Hyperboreans were and how they influenced Greek and Indian religion and philosophy. For me studying real history is much more fascinating than New Age phantasies. This is OT here. I just wanted to give David an example of how ‘sloppy’ western science is in dealing with the history of Eastern Europe in other areas. Majority of Mota's ancestry isn't blue, but from one of the "other African clades". That clade is, in turn, less basal to the non-red ancestry in Yoruba but not sufficiently less(that "d" is also sufficiently short). I had a look at the paper "... Dating of the Middle and Upper Magdalenian of the western Aquitaine/Pyrenean region of France"
If it gives you any ideas, please share. Right, the Yoruba, Mandenka and other W African groups show greatest affinity to the SSA part of Iberomaurisians. What does that prove about where the SSA admixture occurred 20 kya ? When does Mota date to - 2500 BC ? Genetiker posted Taforalt results. All are M78. At last we know that Afro Asiatic languages formed in Africa prior farming. But E M35 overall seems to come from Basal Eurasian side. As expected. Yep Mota itself is pretty young, but we have a Malawian HG from 8100 BP that already had Mota-type ancestry (mixed with South African HG ancestry, the mix stayed stable in Malawi till 2000 BP), so its presence in E Africa is probably ancient. the first anatomically modern humans did not look like black africans, they did not look negroid. Skin color would obviously vary considering even khoisan today are ”yellow” on average in spite of having admixture from bantus now. papuans have denisovan admixture which can explain their phenotype which is actually all over the place without no real uniformity. Onge are highly drifted and certainly do not represent the first humans during OOA. The most likely candidates in terms of phenotype for the first/eaely E carriers and basal eurasians would be something obviously non caucasoid but also non-negroid. im thinking australoid looking something of a combination or a mix between kostenki 14, cheddar man and a veddoid (australian aborigines also have denisovan admixture if i recall correctly so they are probably to extreme to be repredentative. "At last we know that Afro Asiatic languages formed in Africa prior farming." We don't know this, we know something else. Afro Asian languages are not formed in Africa and not prior farming. Natufians do not have any SSA admixture, this is confirmed and established fact at this point. Just accept it. agreed. pure ASI populations would likely carried a lot of BE ancestry. I think it's unlikely that any of the 'Great' language families spread during the Late Glacial. I have a couple of Indian samples in my dataset that are almost pure ASI, and they show very little BE ancestry. Only a few per cent. okey didnt know about that, there goes that theory, regardless BE is almost certainly eurasian in origin both in phylogeny and geography. How much ASI are those samples in percentage and from what tribe/ part of india are they from? They're Gonds from South Central India, probably with less than 20% West Eurasian admixture of any type. So almost purely East Eurasian in a broad sense, and with less than 10% BE. They're the best proxies for ASI in almost all South Asians, except those with a lot of East Asian admixture. If you read up on Egyptian Paleolithic you come across a number of interesting cultures. One of them - Aterian - seems very old. The lithic techniques are called Mousterian but that must be coincidence as Moustrian in Europe is firmly associated with Neanderthals. But it points at something very old. Considering that Egypt is not in the Neanderthal area of the Middle-East I think it would be a good candidate for any admixture without Neanderthal, such as Basal. Or maybe a source for admixture which we call as "Basal-Eurasian". As Karl_K said it might be the case that pure Basal Eurasian in Natufian and Iran_H never was alive in Eurasia proper. thanks, interesting that these Gondi people on average seem to be lighter skinned compared to Tamils which the majority are really dark with some almost being black skinned. Yet tamils have more west eurasian features on average and are more caucasoid in facial features. Considering that african-americans are on average 20% european yet still majority of them look almost the same as their pure west african ancestors, we can safely say that these 80% ASI gonds look very close to the original phenotype of the 100% ASI population. They kind of look like I expected, like how a veddoid is usually described. straight/wavy hair and features similar to both australoids and southeast asian mongoloids. Makes sense I guess it seems like a good possibility that australoids and mongoloids both branched of from ASI somewhere in south asia/south east asia, not long after the initial OOA migration. Well many Gonds have a lot more than 20% West Eurasian admixture, and even some steppe admixture. I'm talking about a couple of individuals who show only about 16% Iran_N ancestry, plus another 5-6% or so of something related to AG3 and MA1, but not steppe admixture. I think the AG3/MA1 stuff is just the algorithm correcting for the fact that there are no perfect references for ASI in my dataset, so I'd say that these Gonds have less than 20% West Eurasian admixture, and even a part of their Iran_N signal might really be ASI. I don't know what they look like though. Are you talking about the Khonda Dora? Looking at the supplemental admixture table from that SE Asia study, they seem to be about 1/5 to 1/4 proper East Asian. I'd be interested in knowing their Global 25 nMonte results, and if they're really more ASI than the Paniya or Irula. Also interested in your thoughts on Taforalt. I did some googling and found out that Gondi are more Munda than Dravidian. "The study said all the Gond groups share a common ancestry with a certain degree of isolation and differentiation. "Our allele frequency (gene frequency) and haplotype (haploid genotype)-based analyses reveal that the Gond share substantial genetic ancestry with the Indian Austroasiatic (Munda) groups, rather than with the other Dravidian groups to whom they are most closely related linguistically," the study said. Though linguistically Gondi-Manda subgroup shares its most recent common ancestry with Telugu, genetically they are closer to the Munda tribes. As part of the research, as many as 18 genetic samples were analysed. "It is interesting to note that the Gond populations received significantly lower number of chunks from Dravidians than from the Munda groups. This conclusion holds even after comparing with the Telugu speakers who are closest to them linguistically," the researchers said." According to Wikipedia, "the prehistory of the Munda peoples is obscure. Although how they got to the Chota Nagpur Plateau is disputed, it is agreed upon that the ancestors of speakers of the modern-day Munda languages migrated westward from the Austroasiatic homeland of continental Southeast Asia." Moreover, Gonds also had their own state and political power: "Scholars believe that Gonds settled in Gondwana, now known as eastern Madhya Pradesh, between the 13th and 19th centuries AD. Muslim writers described a rise of Gond state after the 14th century. Gonds ruled in four kingdoms (Garha-Mandla, Deogarh, Chanda, and Kherla) in central India between the 16th and 18th centuries. They built number of forts, palaces, temples, tanks and lakes during the rule of the Gonds dynasty." Therefore, Gonds are not necessarily a very good reference for Mesolithic Indians. I recall Gonds being a little less ASI than many south Indian tribal groups. Socio-Culturally Groups like the Paniya are far more isolated from surrounding populations and that is likely to true of their genetics as well. The paper by Basu et al "Genomic reconstruction of the history of extant populations of India reveals five distinct ancestral components and a complex structure" did not use two ancestries to describe the modern Indian variation but four: ANI, ASI (Paniya, Irula etc. ), AAA (Munda, Gond, Austro-Asiatic) and ATB (Tibeto-Burman). From their figure 2, one can conclude that AAA are probably migrants from Southeast Asia who mixed with ANI and ASI. On the basis of the admixture analysis, it indeed seems that Paniya are the closest thing to Mesolithic South Indians. I'm talking about Gond1 in the G25 datasheet. I can't really say anything useful about the Taforalt genomes until I've had a chance to analyze them. Paniya have about 30% West Eurasian admixture. The reason they appear to be the most ASI population in the Basu paper is because they carry the most South Asian-specific drift, so they create a South Asian cluster which masks West Eurasian admixture. At the same time, Indian groups that don't share so much of this drift, but which are more ASI than Paniya, end up looking less South Asian and more East Asian. This is one of the problems of relying too much on ADMIXTURE output. Yes, but AAA groups carry a lot of O2a, and I think that on the basis of the new results from Southeast Asia we can say that there has been a considerable flow of Southeast Asian agriculturalists to India in many different waves. That Gond ASI does not represent the oldest layer of Indian ancestry and this must be taken into account. I have no particular problem with the point being made, but the assumption underlying it is shaky. Europe is a continent because Europeans defined it as such. The same people have defined India (South Asia) as a subcontinent. Funny how that works If we brought in our friends the aliens and appraised them of the dispute, I think they'd probably say that Europe is a subcontinent - West Eurasia, as India is South Eurasia. Europe is a continent only in a social sense - geologically, it's a series of peninsulas on the west end of Eurasia. Having said that, it's perfectly reasonable to hold people to clear definitions when making arguments. I checked that the amount of O2a in whole India is 14.5% and among tribal Austro-Asiatics it is 53% and among tribal Dravidians 26.7% and tribal Indo-Europeans 28.6% (Sengupta et al "Y-Chromosomal Variation in India"). Among Irula and Paniya the situation in completely different. According to ArunKumar et al (http://journals.plos.org/plosone/article?id=10.1371/journal.pone.0050269), Paniya and Irula carry 0% of yDNA O! In that paper Paniya yDNA is the following: 15.28 C, 75% F, 1.39% J2a3, 1,39 K-M9, 1.39 P, 1.39 Q, 2.78 R-M207, 1.39 R1a1-M17, 0.4% R2. ... for the sake of comparison, it is also interesting to note the R1a1-M17 percentage in whole India which according to Sengupta et al is 15.8%. R1a1 is only slightly more frequent than O2a, with a difference of 1.3%. Kristiina: Based on the pictures you took from it, this research supports Rob argument. The dates show that Magdalenian had ended in SW France before the Younger Dryas started. I can't comment on main topic of that debate as I am not really well versed in Upper Paleolothic archeology. "The similarity between Indian and Andamanese crania proposed by previous multivariate studies [6, 9, 10] cannot be confirmed by our analysis. Instead, Andamanese cluster with Sub-Saharan Africans, as originally observed by Howells"
Let's imagine the AMH tree with its main branches: African clades(lump them into one for simplicity's sake here), Basal Eurasians, and ENA. What are the odds of very similar specializations wrt to an ancestral phenotype occurring two different times? It's more parsimonious, imo, to assume that Onge and Black Africans are less specialized wrt to ancestral humans. Hence, I this is why I think EARLY basal Eurasians would have been quite SIMILAR to black africans, but down the line, maybe they specialized along their own lines. Colors indicate significant specialization from ancestral cranial/facial phenotype(a certain threshold is implied). Different colors: significantly different types of specialization(e.g. Mongoloid and Australoid). You're basically suggesting the top scenario. I'm saying the bottom is more likely. ??? India has so many Austroasiatics ??? Are you sure Sengupta's estimates are adjusted for ethnic group size? The most populated states of India are West Bengal and Bihar, and both places are extremely R1a heavy, some of the most R1a ethnolinguistic regions in fact. They have, like, 20 times pop density of the Austroasiatic-heavy states like Jharkhand? At least it's an order of magnitude type diffetence. I find Sengupta's figures not credible. Immchr/Jaydeep, care to comment? This requires 5 ghosts in Africa though, and a huge number of very ancient admixtures, not very parsimonious looking... The Reich lab's papers thus far (including this one) only proposed 2, and the 2nd one very grudgingly. I think its fairly certain that the first humans did not look like modern black SSAs or andamanese negritos. Light skin developed individually in mongoloids and caucasoids, and papuans have a different mutation for dark skin than africans but also a unique mutation for blonde hair compared to europeans etc. Also since its been proven SSA have unique archaic human admixture that they aquired after OOA, likely from homo heidelbergensis or some other unknown hominid, this certainly affected their modern phenotype as well, just like how neanderthals affected most eurasians and how denisovans affected papuans/melanesians and australian aborigines. The first humans most likely did not resemble any modern population but had a little bit of everything but very archaic looking. So I think its safe to say that caucasoid features originated in eurasia as well and the reason they exist now in africa is because of backmigrations. Basal eurasian also most likely originated in the middle east and I think their phenotype was likely proto-caucasoid, so something like kostenki, veddoid south indians, cheddar man, jomon etc. And they migrated back into africa bringin haplogroup E and mixed with SSA women and this explains the phenotype of east africans and north adricans which is within the caucasoid spectrum, obviously east africans have more SSA compared to north africans so they deviate more. I think most africans including west, central and south africans have this Basal eurasian admixture from early E lineages migrating back into africa, while the north and east africans have more proper west eurasian admixture which came with younger E clades such as E-m35 and J and T, R-v88 etc. Eh, we know from the pigmentation genetics of Africans that extremely dark-colored skin was is an evolutionarily derived condition. The alleles that contribute to very dark, "black" skin in Africans were themselves the result of recent selection, much like skin and eye and hair color alleles in West Eurasians. The ancestral human phenotype was probably brown-ish. Tishkoff and Brenna Henn did a lot of good work on this, both their papers are worth checking out. Further, the ancestral allele is associated with light pigmentation in approximately half of the predicted causal SNPs; Neanderthal and Denisovan genome sequences, which diverged from modern human sequences 804 kya (62), contain the ancestral allele at all loci. Basal Human (still sapiens) in Yoruba-Mende-Mandenka, and archaic ancestry in Central African pygmies (not all SSA!) at very low percentages is all that you will find support for. 1.There are D-Stats using Biaka, Mbuti, Mota, and Yoruba, but what about Hadza, and in particular, the ancient Hadza-like Tanzanian? In other words, what does "Sub-Saharan" mean in relation to "African" when to some people, the Hadza look like "Eurasians"? 2. Regardless of whether a component is "Sub-Saharan" or not, I think a valid test of whether it's specifically African is the lack of Neanderthal admixture. If there was a "North African" component that is lacking in Neanderthal admixture, how does that mean that it's "Eurasian"? It's just another isolated African component but one very different from the other LGM Africans (aka "Sub-Saharan Africans"). Region 7 would be completely uninhabitable and an insurmountable barrier to any contact between hunter gatherer groups. So "Basal Eurasian" could really be from this non-Sub-Saharan yet completely African population. Any statistics on Neanderthal admixture among the Taforalt Iberomaurusians,and their shared supposedly "Basal Eurasian" component with the Natufians? There seems to have been only one pulse of Neanderthal admixture, from a population ancestral to both the Vindija and Mezmaiskaya Neanderthals, but different from the Altai Neanderthal. The 30% "additional" Neanderthal admixture found in East Asia apparently was not from an additional pulse of admixture from a separate East Asian Neanderthal population. Rather, "another possible explanation would be dilution of Neanderthal admixture in Europe due to migration from a population without Neanderthal admixture (Meyer et al., 2012, Vernot and Akey, 2015)." Did this North African LGM refugium "Basal" (non-Neanderthal admixed) population "dilute" Neanderthal admixture among West Eurasians, in what in effect would be second post-LGM "Out of Africa" wave of admixture? Please put aside whether these were "Eurasians in Africa" based solely on modern phenotypes. (The one "non-African" phenotype that these North Africans had seems to be rs17646946=AA, which confers "Eurasian" straight hair.) Try to consider only Neanderthal admixture as a criterion, especially given that archaeologically it seems there was Neanderthal admixture with AMH in the Carmel Caves before the dispersal of AMH throughout Eurasia. A "Basal Eurasian" non-Neanderthal admixed population from 48 kya to 13 kya seems highly improbable, a native North African one where part of the population exited Africa to the Near East after the LGM makes perfect sense. Of course, this corresponds very nicely to tMRCAs and the distributions of the early clades of Y-DNA E-M35 (E-L539 and E-Z827) which have Africans at the root (now including "partial" E-M78*) , but where the Natufians are E-PF1962 well within E-Z827. This is an independent line of evidence from autosomal admixture and paleoclimatology. So what was your conclusion from the Barshay paper ? Because the Bushmen are well represented in the more recent archaeological record, Dr. Harvati said, they were expected to bear a close resemblance to the Hofmeyr skull. Instead, the skull was found to be quite distinct from all recent Africans, including the Bushmen, she said, and it has “a very close affinity” with fossil specimens of Europeans living in the Upper Paleolithic, the period best known for advanced stone tools and cave art. Nobody considers Hadza as eurasians, they are highly inbred but still carry some eurasian admixture mainly from cushitics. D-stats with them would still not show any affinity with natufians. North africa is a possibility, but it still doesnt matter because based on phylogeny and autosomal dna these north africans would still be closer to eurasians rather than SSA. But with this study it makes north africa less likely considering SSA ancestry is apparantly very ancient in the region, probably the aterians had SSA related admixture which the iberomaurusians aquired when they came from the middle east with E-m35. It doesnt make sense for the migration to have been in the opposite direction because these iberomaurusians are significantly older than natufians and carry a lot of SSA admixture, if the movement was out of north africa into the middle east how did this SSA admixture vanish in natufians? it doesnt hold up. Also the SSA in taforalt is said to be a ghost with no true proxy yet they still managed to find affinity to modern SSA populations. Why would Hadza or some hypothetical ghost population from paleolithic north east africa be able to contribute to natufians without them showing some affinity in D-stats towards modern SSAs? Its extremely unlikely. The Sahara desert is a much greater barrier for geneflow compared to northeast africa which has the nile river where all populations would have eventually interacted, yet north africans still did not avoid geneflow from southern populations, how in the world would basal eurasians be able to remain unmixed in north east africa for such a long time that they could contribute to natufians who are 13.000 years old at most without bringing any SSA admixture? In the southwestern area, the number of sites seem to decrease c. 14 ky BP. The next transition period is named LUM/AZ-LB (Later Upper Magdalenian+Azilian+Laborian). The transition period seems to end during the Younger Dryas. The Younger Dryas seems to be mostly AZ-LB, but the number of sites seems to be smaller and there was less human activity. According to that paper, "haplogroup R1a1-M17 characterizes 17.5% of the Indians. The Indo-European speakers demonstrated a significantly higher proportion of this lineage as compared to populations belonging to Dravidian linguistic family. ... With the exception of Lodha, Nepali and Bhutia, all other Austro-Asiatic and Tibeto-Burman speakers lack this haplogrooup in their Y-chromosomes." "Haplogroup M95 ... accounts for 15% of the Y-chromosome variation in India. It is however localized to the eastern part of the subcontinent, restricted among the Austro-Asiatic speakers (72.9%) and Tibeto-Burman speaking tribes (56.4%) of NE India. Although this haplogroup was also detected in Indo-European and Dravidian speakers (3.3% in total)..."
Well, it's true. Including basal, I have 5 ghosts there(must be at least two in "other african clades" to account for JuHoan and Yoruba differences). 4 is more parsimonious than 5, I agree, but conditions may have been right for the extra split to take place. Not sure I understand, which are the 4? Mota is not really a "ghost", since it has already been found and the quantification of its descendant contributions in modern Africans is done (Hadza and Ari most similar, well distributed in East Africa, all others less similar). Sorta like CHG (Kotias and Satsurblia) and ANE (Mal'ta and Afontova-Gora). The only ghost remaining in Eurasia is Basal and the only ghost in Africa is whatever it is that connects Taforalt with C, S and E Africans such that it cannot be purely a Yoruba+Natufian combination (which the authors do not specify whether or not its required to be a ghost or if its just a combination of Mbuti-Biaka, Ju-Hoan and Mota-Hadza ancestries, though they probably lean toward the former because even turning up the contribution to 100% Hadza or Natufian or Ju_Hoan, i.e. exploring the combination space, doesn't work. If one of the populations gets fitted the other populations don't fit). ^^ That's for Reich though, if we include the Max Planck people then we get another one specific to East Asia, the "highland East Asian" population best represented in Sherpa. Other than these I dunno if there's any? I don't deny that Caucasoid features developed in Eurasia, but a proper package of proto-Caucasoid features first reached prominence in the k14 clade, not in Basal Eurasians. David even made a post here titled "Kostenki: Morphologically Caucasoid" a while back. Basal-rich Caucasoid affinity owes itself to an ancient admixture event of basal with K14 subclades. Somalis, Oromo, Amhara, etc., btw, have basal-RICH back-migrant ancestry, which includes K14 elements. f4 (WHG, Ami/Onge/Han/etc. ; AA-speaking Horner African, Chimp) is not zero. Let's suppose you're right and Basal Eurasians were morphologically Caucasoid shortly after split from other OOA---i.e. quickly fixed for a bunch of different alleles critical in the package. So, per dashed clause, let's also assume that the common ancestor during the time of basal and other OOA split was less lopsided in its "p and q" allele set*(i.e. more diversity for relevant variants). You're essentially saying that another split took place later on(ENA, K14) with (statistically)the same set of alleles being fixed in K14 as was earlier in Basal Eurasian. Again, it's the top diagram. Parsimony issues. Plus, considering that the Gulf Region is nothing like Europe and/or northern Middle Eastern areas like Georgia, Black Sea Anatolia and Chechnya, different selective pressures are expected. Now, if the Caucasoid morphotype depends on a lot fewer alleles, then it's another story. If we restrict ourselves to only skin tone(say, governed by a handful of loci), I agree, convergent evolution is much more likely to occur. People living near the equator will be dark(or risk sunburn, cancer, etc). So, it's more likely---for one trait alone---that Onge and Yoruba are convergent. Looking at your doodles- where are you picking up 2 sources of basal ? Are you talking in regards to "Basal-Rich 1" and "another basal rich pop"? A single basal source for those is implied, but potentially two SUB-clades of that basal clade(OR, just different clades of Western HG admixture in the basal rich populations). Oh, in terms of actual ghosts(as opposed to total number of splits in the chain leading up to Crown Eurasians), I'm suggesting 3: Basal, the red clade in my first posted diagram here(para-Eurasian) and another ghost to explain similarity of Tafouralt with S Africans. "Now, if the Caucasoid morphotype depends on a lot fewer alleles, then it's another story." In my experience, two different white people can have completely different facial structure. There's lots of variation. Facial structure isn't the same kind of racially defining trait as skin color. I think that's important to keep in mind. Maybe, all Europeans have features unique to west Eurasians but all don't belong to variations of a single type. It would make sense something in WHG/UHG is where most 'Caucasoid' traits come from. EEF & Steppe were both UHG rich. When I first looked at the map caption I thought like you, then I realized that what they meant was these EHG locations plus the steppes. I.e. +steppes. That would be a very cryptic message indeed. But no, in the map key they have CHG EHG and Caucasus + steppe, as in CHG is from the Caucasus, and the EHG sample from Karelia is from the steppe. So they probably think that all of European Russia is the steppe. A little of topic maybe. Years ago I read a study about the skeletal differences between Homo Heidelbergensis en Homo Rhodensiensis. Apparently they found that Homo Heidelbergensis had a thinner skull wall than Homo Rhodensiensis. However Homo Rhodensiensis had thinner bones in the rest of the body than Homo Heidelbergensis. I wonder if there is an update about this ? There doesn't seem to be as much SSA in Iberomaurusians as the paper says. The qpAdm fits are pretty horrible using a West and East African source. These are also pretty bad if you want any SSA in Iberomaurusians... I'm gonna have to look at this harder, but the SSA in these samples is disappearing and it is asking for Iberomaurusian admixture in Mende and Dinka. Only Dinka goes into Iberomaurusians at the moment, but that might disappear soon.... This just gets more and more odd the deeper I go. can you get an f3 signal for Iberomaurusian into Africans? Drifted and low coverage samples don't produce negative f3 mixture signals even if the sample is really mixed, we've seen this previously with Kalash etc. That's simply not true. I can get negative f3s with WHG, the most inbred group. You just need to ask the right questions with stats. It is true, an old and noted phenomenon. Kalash don't get negative f3 mixture stats using various populations while those among their neighbours that have similar ancestral components do and that is because Kalash have an unusual amount of population-specific drift. Honestly, I don't believe there are different, equally valid definitions of Europe. The eastern border of Europe are the Ural Mountains and the Caucasus. Hence Russia has a smaller European part and a larger Asian part. Ditto with Turkey. (The difference being that the historical nucleus of Russia was in the European part, and Siberia was colonized by ethnic Russians quite recently - while the historical nucleus of Turkey was in the Asian part). More controversial would be the question what exactly central Europe is - and where eastern Europe begins. E.g. Poles like to point out that their country is part of central Europe. But to many westerners already the Czech rep. is part of eastern Europe, because it used to be behind the Iron curtain for a couple of decades. Yet, from a purely geometrical point of view the midpoint of Europe is somewhere in the Baltic IIRC. I'm sure there's something out there that will give negative for the Kalash. They aren't anywhere near as homogenous as WHG and I can get a negative with them. It is about using the right populations. Agree on a subset of WHG/UHG ultimately being the culprit. As for the finer differences between Europeans and modern MEs, I recall you or someone else proposing once that CHG has smth to do with it(pointing out some distinctive traits seen in CHG-rich pops). Imo, it's probably a bit more complex than that and may be owed to an expansion of post-Halaf ANFrich ancestry. Basically, after Anatolian NFs left Europe and CHGs left to mix with EHGs, a back-n-forth interaction zone developed in the ME involving, but not limited to: ANF-rich from North Mesopotamia going to Caucasus & Zagros and subsequent south-bound KA expansion(ANF-CHG) from South Caucasus(with potentially a lot of fixed alleles?). DNA from this zone radiated into Anatolia(givins us Anatolia_BA), Egypt and then eastward. Modern Pashtuns often overlap with MEs, but it's worth noting they get Iran_Chl as a substrate, not Iran_N. Now, Berbers' ancestors were not affected by these specific ANF-rich, CHG-marked waves, and, hence, lack many distinctive ME features. In fact, I'd say a lot of those(somewhat cherry-picked) Kabyle and Riffian folks touted on race boards provide an indication into how EEFs looked like. Sardinians and many Iberians too, obv. Balkans and S. Italy were affected, as you know. Pigmentation isn't quite as good of a predictor of cladal belonging(or clustering if you wish) as facial and/or cranial traits are. I mean, forensic specialists are easily able to distinguish between crania of modern SSA and modern West Eurasians. On a more finer scale, it's relatively easy to distinguish between a group of light-skinned MEs and darker skinned or tanned Europeans(let's say, Iberians, Occitans, Padanics, North and East Euros; Balkaners and S. Italians can be tricky). One distinctive feature, for instance, are less prominent eyelids. Thanks for running and sharing those. Stats match my expectations. I'd say there are high-consensus regions and lower-consensus regions depending on different criteria we choose to overlap like: past WHG coverage, EEF coverage, post-Beaker era depth of ties(genetic and cultural) across the continent, etc. The critical point in Western Russia's history were massive early medieval Slavic expansions into the area, imo. Imagine that such a scenario did not take place. The cultural and genetic ties of that region to Europe would be much less pronounced today. Perhaps I am being paranoid, but after the Cheddar man fiasco, I am suspicious. Therefore I think this may come from a desire to ascribe a non-European origin to the Proto-Indo-Europeans.